One of the most beloved Western Gurbani Kirtan artists in the world (she’s produced 18 Kirtan albums to date), just about anyone with a passion for this musical form is familiar with Satkirin’s unique fusion of Latin and World rhythms with Western and Indian Classical Raag. “I don’t limit myself to just one musical style or sound,” Satkirin shares. “I’ve always aimed to create a fusion in my music. It’s important to me. I see Gurbani Kirtan as a soul language that unites cultures and people. Growing up in a musical family Satkirin started singing for hours any jingle or song of spirit. She then taught herself to play guitar as a teenager, spending many hours singing folk songs in the music room of Penn State University where she earned her undergraduate degree in Fine Art and Psychology. After pursuing a graduate degree at San Francisco State University she changed course and joined the Youth Service Core of the American Friends Service Committee doing peace corp type service in Turkey and Israel. On return from her International service Satkirin was drawn to the practice of Kundalini Yoga as taught by Yogi Bhajan. She helped found the 3ho Kundalini Yoga Ashram in San Diego. 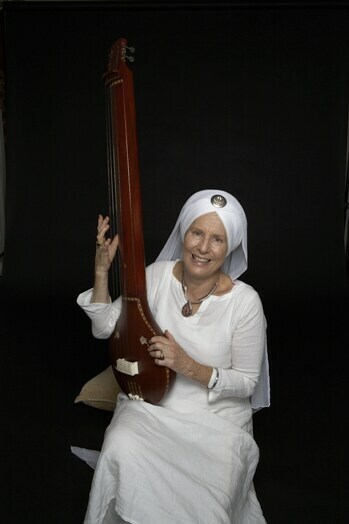 Her study of Gurbani Kirtan began on her first trip to India with Bibi Amarjit Kaur. And soon inspired by her experience of transformation at the famed Golden Temple of the Sikhs in Amritsar she continued to study, practice and perform world wide with well-known ragi- Sikh singer artists such as Bhai JaspalSingh, Bhai Hari Singh, Bhai Dya Singh, Ustaad Narinder Singh,Ghulam Mohammed Khan. Satkirin’s immense dedication to the yogic sciences has taken her all over the world to share this knowledge, which she began learning directly from her teacher, Yogi Bhajan, in 1970. She is a teacher trainer of Kundalini Yoga with a deep, direct understanding of this yoga discipline. She teaches at the annual 3HO Winter and Summer Solstice events and at Women’s Camp in New Mexico. As a Sikh Minister, appointed by Yogi Bhajan in 1974 to the position of Guru Granthi to the Los Angeles Gurdwara (Sikh Temple), and now serving the Manhattan Gurdwara, Satkirin projects grace in exalted service for the care of the Sikh HolyScriptures, the Siri Guru Granth Sahib. She teaches the sacred language of Gurmukhi to the adults and children of the community and performs Sikh religious ceremonies. As part of her mission to disseminate peace and service through music, Satkirin is a representative to the United Nations Department of Public Information for the NGO of Healthy Happy Holy Organization (3HO Foundation). In addition, probably her most impressive contribution is raising two sons, with her beloved husband Siri Vishnu Singh. Gurumustuk Singh is the webmaster and founder of the famous Sikh-devoted website, www.sikhnet.com, and father of two children aged 5 and 10. Dharam Singh her younger son is a musician as well and attends college in San Francisco, California.